Here's a beautiful bamboo and steel wire trellis that you can easily build for your container or garden pot. Other than a pair of pliers with a wire cutter, you won't need any special tools. Originally, all I wanted was a garden pot to cover a concrete patch in the middle of the grass lawn. This is a 1 foot square concrete slab that serves as a cover for a catch basin. You see, the slab's color sticks out amidst the lush green color of the lawn and so I wanted to hide it. But I also had some flowering garden vine seedlings that needed transplanting and so a garden pot with its own standalone trellis was worth considering. By standalone or freestanding, I refer to trellises that are not mounted to lean against a wall. Climbing vines on these trellises are easily maintained. You could conveniently prune unwieldy vine branches as you go around the trellis. Also, there is less wastage of foliar spray as nothing goes to runoff on walls. By having a standalone trellis in a container, you can also move the plant container with its trellis for any reason. When the climbing vine matures with a burst of flowers, I plan to showcase it in my front porch. By the same token, I can move the entire plant container to somewhere safe in the event of strong typhoons. Around the internet, I went looking for some bamboo trellises used in garden containers. I had some leftover bamboo strips from a previous project that I could use for a garden trellis. The examples that I saw were sadly, not sturdy enough. The sample freestanding trellises were assembled out of bamboo, plastic or thin pieces of wood. Most of them however, were simply staked into the soil of the garden pot or container. One trellis had its thick pieces of wood duct-taped around the outside of the garden pot. I realize that these are homemade garden solutions but they simply will not do. The garden vine I planned to plant is Thunbergia Grandiflora. It is a fast-growing vigorous vine considered by some as invasive. For this reason, the trellis structure should be high enough (6 feet). I, of course, would be pruning it continually to keep it contained. But the trellis should be sturdy enough to withstand the weight of the vine's foliage. A staked in trellis would easily collapse when the vine reaches it's maximum height. When the monsoon rains come, rainwater can easily drench and loosen the garden pot's soil. With the rains, come the winds that could then easily topple the trellis structure along with the thick foliage. 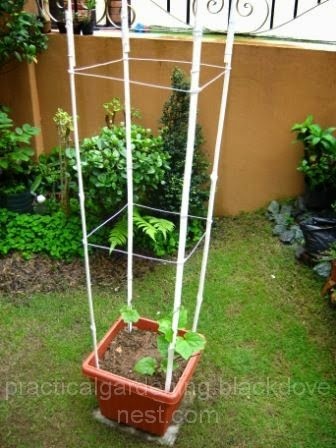 The sturdiness of a trellis will be dependent on how the legs of the trellis structure are secured in the container. The legs of the trellis will undoubtedly be made of bamboo, for now. So I decided to incorporate trellis leg holders into the garden pot itself. The holders will be permanently affixed to the container and will hold any type of trellis material that has a maximum thickness of 3/4". When you've mounted the trellis and ready to plant, simply fill the garden pot with soil, burying the trellis leg holders. Although the trellis leg holders are permanently fixed to the garden pot, the garden trellis structure is not. Should you decide in the future to remove the trellis, you can easily slide out the structure and reuse the garden pot for other plants. You wouldn't even know the trellis leg holders are there. See Part 2 of this article for a discussion on how to build the container trellis.